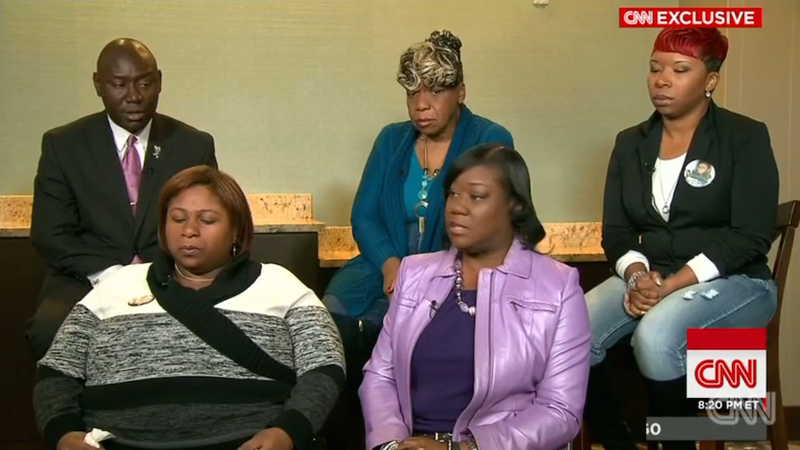 The mothers of four slain black men and boys, three of whom were killed by police sat down with CNN's Anderson Cooper for a heart-wrenching interview where they made one thing absolutely clear: their sons would be alive if they were white. "It seems our kids are getting younger and younger," Fulton said. "They're killing them younger and younger. There is no regard anymore for human life. There has to be somewhere where we draw the line and say, 'Listen, our kids want to grow up, too.'" "We have to change mindsets," Fulton said. "We have to let people know that our children matter. Our sons and our daughters matter. We are hurting. This country is hurting." Carr stated that if her son Eric Garner was a white man caught selling cigrrettes, "they would have given him a summons and he wouldn't have lost his life that day." McSpadden stated she was certain that Darren Wilson was going to be indicted without a video tape: "You had so many witnesses." Rice, whose son's death has been ruled a homicide, revealed she allowed the footage of her son's death to be released so "the world knows" what happened to her son. All of these women have suffered immense pain, and it's maddening that they have to justify their pain and the injustice they feel as mothers of unarmed black victims. When Cooper asked if they thought things would have turned out differently if their sons were white, he framed it as a "hard question to ask." But for these four mothers, it was the easiest one to answer. "It's not happening to them, so they don't quite get it," [Fulton] said. "They don't quite understand. They think that it's a small group of African-Americans that's complaining. ...The people say that all the time: 'What are they complaining about now? What are they protesting about now?'" "Until it happens to them and in their family then they'll understand the walk. They don't understand what we're going through. They don't understand the life and they don't understand what we're fighting against. I don't even think the government quite gets it." When Cooper (for some reason) asked them how to change the perception of black people in the country, Fulton gave the most honest answer: "divine intervention."